I wonder if we’ve elevated the idea of equality to the point that we find true service demeaning, rather than seeing it as a way of respecting others. It’s post-Christmas hangover…or some equally lame junior high excuse..
Perhaps. I don’t remember that kind of service when I went there before. I hope it is an just post-Christmas fatigue. I am not going to argue with you, Miss Susan. I had a very similar experience at a restaurant today……so I ditto the rant. Apparently a nationwide trend. I think I need to buy me a cane to shake when I rant. 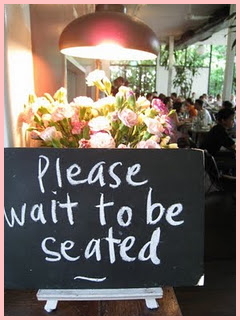 I had a similar experience today, too (not with a waiter, but while sitting on a bench outside of a restaurant). . . maybe social media is to blame – I’m undecided on how I feel about it (definitely a future post). Apparently it’s the same everywhere. I look forward to hearing your experience and your take on it. I blame texting. Folks are so used to communicating without having to use vowels. How can we expect them to add an extra “Miss” or “M’am” or “Sir”? You may be right, Miss Elyse. I wonder how things will be spelled in 20 or 30 years. You would be more than welcome to stop by for coffee, Miss Painter Lady. Fun post! I like your humor in getting your point across. Purty made me laugh – reminded me of my sister and I talking about family jargon when we were young. Purt near – as in “we are purt near there” brought gales of laughter from my sister and I. My daughter, looking puzzled, ask if we’d spell “purt near”. My sister passed a little over two years ago and in addition to being a fun read, your post brought back a special memory. Thanks! I’m glad you liked it. Are you from the South by chance? I did a lot of my growing up in Texas and people there really do talk purty and people say purt near. It’s the same ignorance that had a waitress greeting me and my 90-year-old aunt with “Hi, guys, what can I get for you?”. And we were called “guys” twice more before we left. I wanted to trip her, too. Sadly “guys” is ubiquitous. People are using language to walk in your front door without knocking, and I don’t like it. Maybe we need those old-fashioned calling cards with our formal name embossed that we hand to the server. Or have vocabulary cards with proper greetings on them that we hand the server and ask to read before we follow them to the table.